Must be a graduate of any Bachelor of Science courses; Must have at least one(1) year experience in a manufacturing set-up; Experience in Production Planning and Control will be an advantage; Must have excellent interpersonal and people skills, Team-worker; Must have an analytical mind to identify errors and inconsistencies; Must have computer literacy to use production planning systems and standards office automation tools; Preferably with strong background in DAX and Excel. Male/Female; Must be at least 30 years old and above; Must be a a graduate of Engineering courses preferably Industrial/ Mechanical engineering courses; Able to judge product systematically; Experience in Quality Control / Quality Assurance is an advantage; Must have a normal 20/20 vision; With leadership skills; Must be computer literate (excel / window-based application); Patient and can work overtime; Able to maintain good interpersonal relationship with superiors and colleagues; Can work under pressure and with minimum supervision. Female; With at least 2 years of college education; With extensive knowledge in Nihongo; Has good interpersonal skills; Can communicate in English language; Must be computer literate; Able to maintain good interpersonal relationship with peers. Male; 18 – 24 years old; With pleasing personality; High school graduate. Male / Female; 20 – 28 years old; High school graduate / College level; With at least one(1) year experience as Gasoline boy; Customer service oriented; Willing to work on Sundays and Holidays and in shifting schedule. Graduate of Bachelor’s degree in Civil Engineering, preferably with Professional License; At least 3 – 5 years of work experience as Project Engineer / Manager specializing in Engineering- Civil / Construction / Structural or equivalent; With skills and specialization in project management and material procurement; Ha a good leadership skill for site supervision, result oriented and can mutli – tasks; Good at quantifying and costing, knowledgeable in MS Office; Must be willing to work in Mariveles, Bataan. With experience as Welder; Welds metal parts together for repair and/or construction of marine vessels. College graduate; With related experience. Male; Not more than 40 years old; Bachelor’s degree in Information Technology or Two(2) years certificate from college or technical school with one(1) year related experience and/or training; Able to promptly answer and support IT related requirements; Knowledge in troubleshooting CPU, Laptop and Biometrics and POS system operations and maintenance; Attention to details and quality oriented; Open to flexible time schedule. Male; Not more than 45 years old; High school graduate / Graduate of any technical course; With at least 3 - 5 years or work experience in construction field ( horizontal and vertical construction including finishing works); Must have strong personality to lead the construction workers; Trustworthy and can work effectively under pressure. 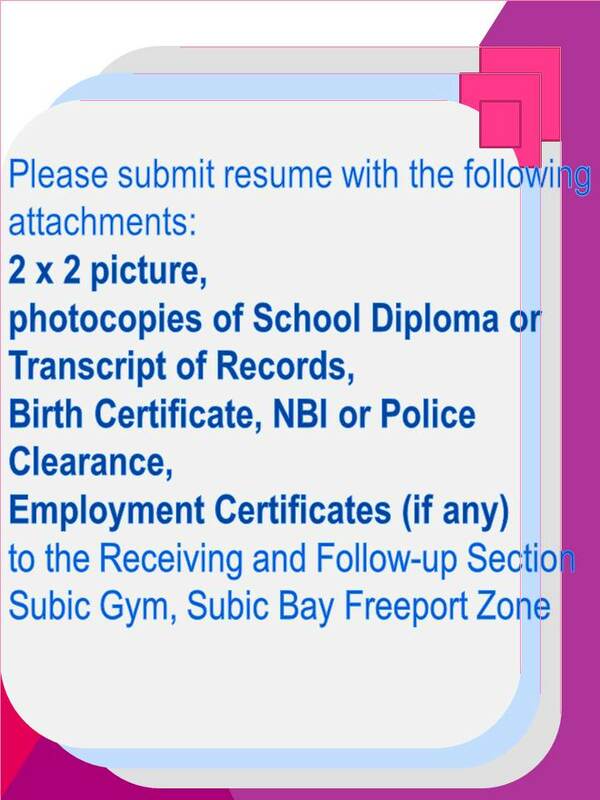 Not more than 45 years old; College level / Graduate of Electrical courses or equivalent; With at least 3 - 5 years of related work experience; With background in building maintenance, safety and engineering works; Knowledge in canvassing / purchasing materials; With valid Professional Driver License; Can drive in Metro Manila area; Trustworthy and can work effectively under pressure. Male Female; 19 – 30 years old; Vocational graduate or College level. Female; Not more than 35 years old; College graduate or its equivalent; With at least three(3) years solid exposure as Executive Secretary; Must be proficient both in oral and written communication / correspondence; Dynamic, Creative, Smart and can relate effectively with people from all walks of life; She must be highly organized, able to give administrative support to higher management. Male; Not more than 35 years old; College level / technical course graduate or its equivalent; With at least five(5) years experience as Company Driver in a hotel or service industry; Must have professional driver’s license and must be knowledgeable of Manila route and other part of Luzon; Responsible, matured thinking, keen to details, trustworthy and can work under minimal supervision. Male/Female, Must be a Licensed Occupational Therapist; Preferably with at least 1 to 2 years of relevant work experience; Can work under pressure and with less supervision. Female, Must be a Licensed Physical Therapist; Can work under pressure and minimum supervision. Male/Female, 25-35 years old; Must be a licensed Medical Technologist; Preferably with 1 to 2 years related work experience; Can work under pressure and with minimum supervision. Male; Must have attended the BLS, CPR and First Aid trainings; Must possess a professional driver’s license, with restriction code #2; Can work under pressure and with less supervision. Female, Must be a graduate of any Business course; Can work under pressure with minimum supervision. Male / Female, Must be an Accounting graduate; At least with one(1) year experience in General Accounting; Can work under pressure with minimum supervision. Male, Must be a license Nurse with ACLS Training; Can work under pressure with minimum supervision. Male / Female, Must be a license Nurse; Can work under pressure with minimum supervision. Male / Female, Must be a license Nurse; With IVT Training; Can work under pressure with minimum supervision. Male, At least College level; At least 6 months experience in bedmaking, changing of beddings; Can work under pressure with minimum supervision. Male, Can work under pressure with minimum supervision. Male, At least High school graduate; With knowledge / skill on Plumbing and electrical works; With experience in cabinet making; Can work under pressure with minimum supervision.